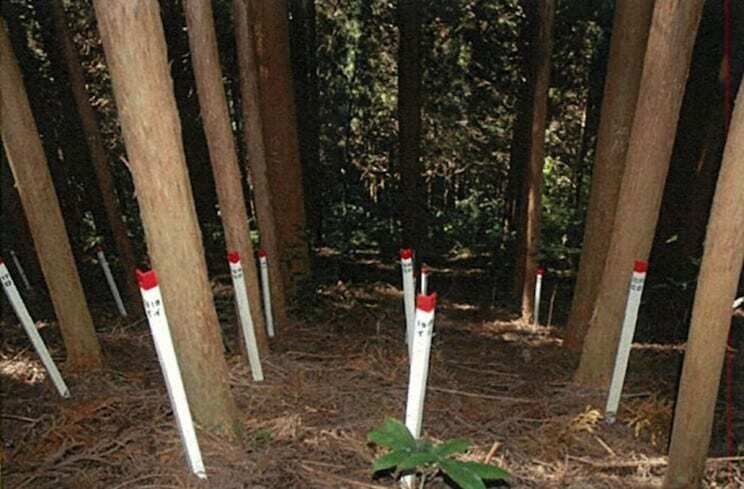 It all started in 1973 with an experiment into tree growth and spacing in the Miyazaki Prefecture of southern Japan. 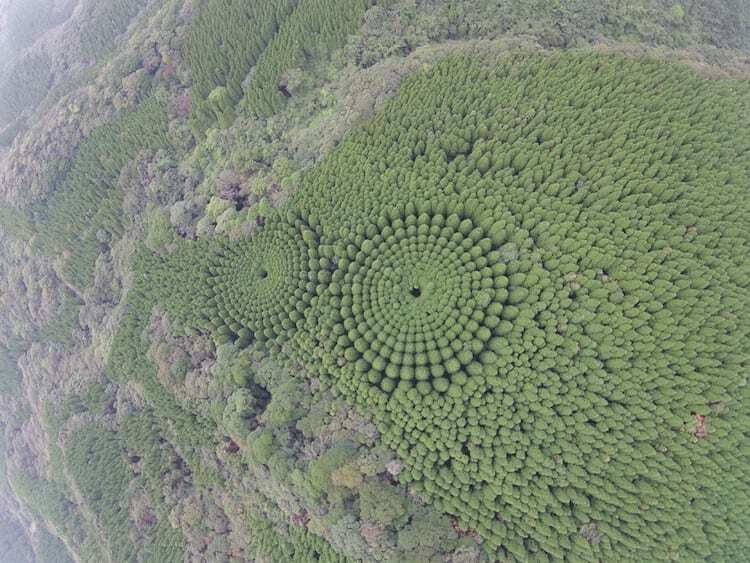 After overhead photography recently revealed these beautiful crop circles, the Japanese Ministry of Agriculture, Forestry, and Fisheries released a document explaining how they came to be, and it doesn’t involve aliens (much to the disappointment of some conspiracy theorists). 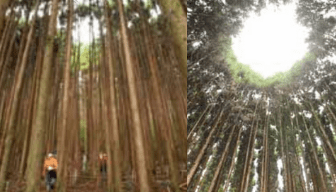 Almost 50 years ago a parcel of land near Nichinan City was designated an “experimental forestry” site. 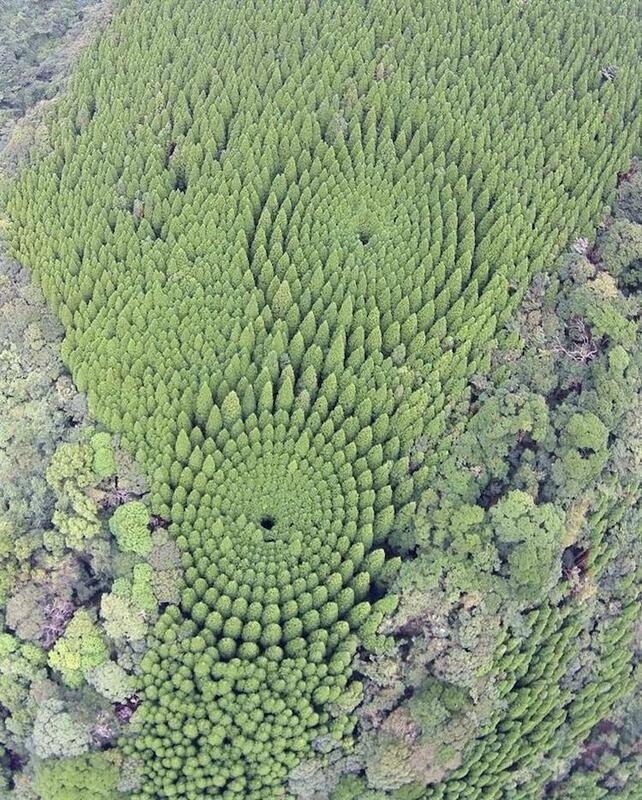 Officials planted sugi (or Japanese cedar) trees in 10-degree radial increments forming 10 concentric circles of varying diameters. They weren’t sure exactly how it would turn out, but the goal was to see if and how the trees would grow – would the planting pattern affect their size, foliage, or height, etc? The original theory was that trees planted farther apart develop a canopy (the upper layer) close to the ground. 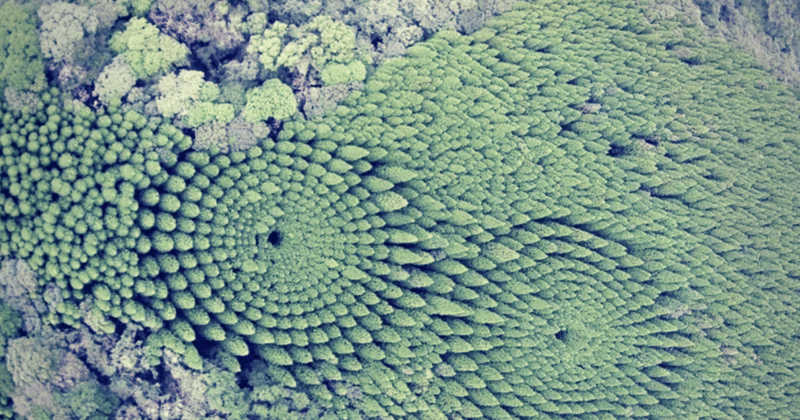 Part of what makes these tree circles so interesting is their concave shape (notice how the trees curve inward and are shorter in the center). It was an unexpected result, but shows that the closer together you plant these trees, the more it changes their standard growth patterns. 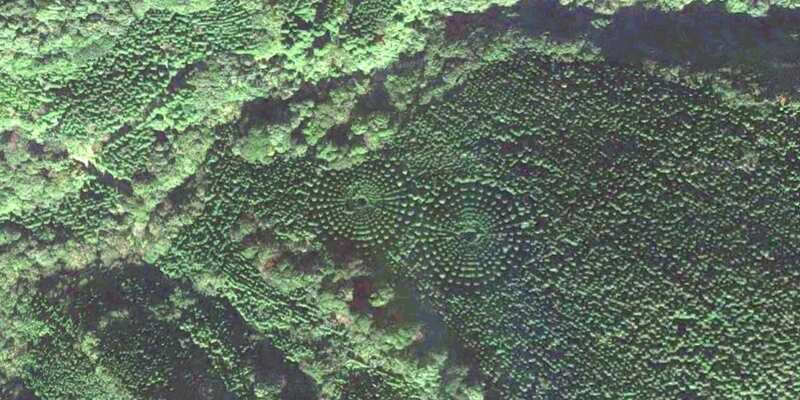 In this case, the outer circles consist off bigger trees (by about 5.3 meters), while trees in the center were smaller (although they look quite dense with foliage from above). 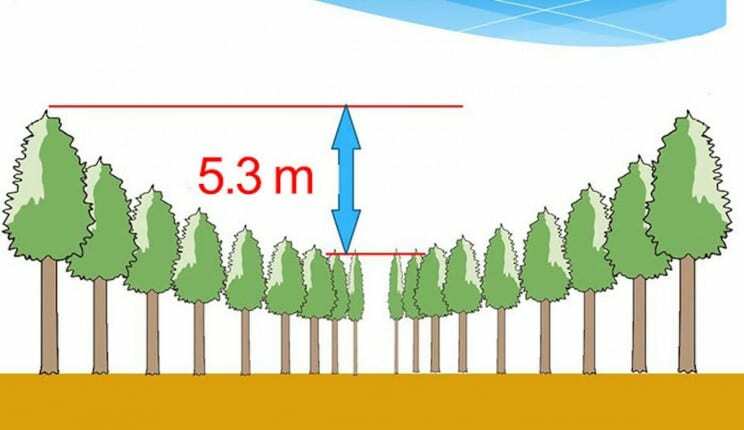 The height difference is because trees that are planted farther apart have more access to resources like sunlight and water, while trees in the center have to compete with one another – and since there’s not enough to go around, their growth is stunted. Outside of Japan, the tree is known as Cryptomeria japonica (indicating it comes from Japan) and is the only tree of its type (it’s genus, specifically). While it’s nicknamed the Japanese cedar, it’s actually not closely related to true cedars. The trees have also been cultivated for centuries in China, but are the official tree of Japan, often found planted near temples and civic buildings. Anyone interested in viewing the circles on Google Earth can go to coordinates 31°43’50.3″N 131°23’04.9″E to check it out. You can scroll around the area and zoom in and out of the circles to get a better view. While the scientists planted 10 total concentric circles, only 2 showed the growth pattern the Internet is going wild over. Originally, the plan was to harvest the trees in 5 years. According to the official Japanese Annual Report on Forests and Forestry, the Japanese cedar was the most popular tree harvested in Japan and accounted for 57% of it’s total. The need for lumber has increased in Japan due to a demand for new houses and other construction, but new trees are planted every year to reduce deforestation. 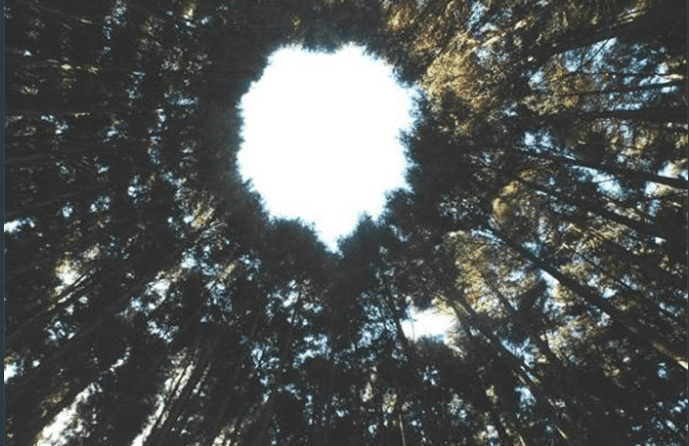 Of course, these trees are so unexpectedly beautiful and have garnered to much public attention over the last few weeks that Japanese forestry officials are now considering leaving the circles alone so they might become a tourist attraction, drawing thousands of visitors and creating future nature lovers the world over.